I've been watching with interest the way that the BBC has been trying to discuss future developments for their interactive online services like blogs and messageboards in an open way. However, rather than make the process smoother, they have managed to get the collective back of the Points Of View messageboard up, and Jemima Kiss picked up on the story in the Guardian. Seeing how events then unfolded is a very interesting study in group dynamics online. A BBC Points Of View messageboard user read Jemima's piece, and the board went on to interpret her editorialising as direct quotes of the views of Nick Reynolds, the BBC Internet Blog editor. "I can recognise the concerns from users, especially if they have built up a community of fellow regulars on a format that works for them. But I can't help feeling that longer term, messageboards have too little structure to easily invite newer users, are complex to browse and don't have the topicality of chronologically organised blogs. Aren't they just a legacy format, headed the same way as betamax? It's not that blogs are the perfect answer, but that answer is probably a combination of many things far more open and distributable than messageboards. For that reason, I also think users are far more likely to have their voices heard on a good, readable, well-focused blog that has contributions from more senior production staff. Isn't that the point?" "That Guardian article reveals your true feelings. It also reveals that you have not appreciated the fundamentals of our arguments." "Saying one thing and doing another is my impression. Yes it does make the heart sink." "I just will not believe a word that man spouts now!" "The only way you're going to regain any part of our trust, Nick, is to somehow convince us that you did not say what the article says you did." "So Nick... these words are NOT yours - is that correct? How come you didn't correct our reasonable assumption that they were?" Look at that in the abstract for a moment. Someone saw a quote from a named employee of an organisation on the website of a national newspaper, and then posted onto a messageboard of that same organisation a misinterpretation of who had said what. Within a couple of hours that named employee came on the board and pointed out the error - and they were indignantly asked why they hadn't done it sooner. I'm beginning to see here a pattern of behaviour which is like a customer service version of Loosemore's Law. The quicker we are able to submit feedback to an organisation, the less patient we are with the response time. 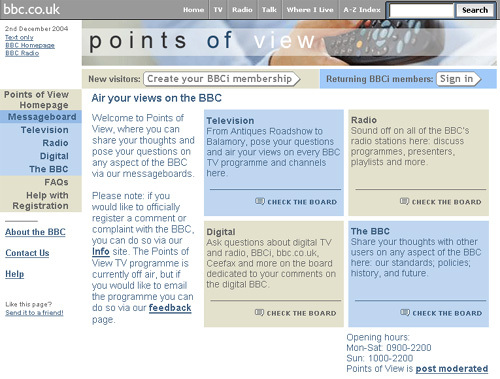 The current bunch of users of POV have worked themselves into a frenzy, believing that the BBC has already decided to close the board down in favour of blogs, a form of online communication to which they seem implacably opposed. I must say that, nice chap as I know him to be, Nick Reynolds made a tactical error up-front by first trying to engage in a discussion about the future of the board back in November away from Points Of View itself. More than anything, that seems to have got them outraged. It is a fascinating online cultural smash, but, the fundamental problem still for me seems to be that just because the BBC can do a board dedicated to general chit-chat about TV, should it? It has never really been clear to me what the POV users get on bbc.co.uk that they couldn't get on the message boards at Digital Spy or UK Nova. Tomorrow I'll be posting a bit more about my experiences of hosting the board in 2004 and 2005, and why I don't think it is the best forum for the BBC to interact with their audiences. By Martin Belam on 16 February 2009. Frankly, I was shocked by the idiocy of the people on those boards. I posted a comment or two essentially saying I agreed with Nick's plan to move it under TV dept and what happened? Was I argued against? Was I asked to defend my plans? No. I was accused of being a BBC plant and they went googling my username to try and find my employee details. By this point I'd came to the conclusion the whole board should be disposed of so stopped contributing. "It has never really been clear to me what the POV users get on bbc.co.uk that they couldn't get on the message boards at Digital Spy or UK Nova." Many organisations restrict the websites that their employees can reach from work, presumably to stop people from hanging out on the web when they’re supposed to be working. However, quite a few workplaces allow access to bbc.co.uk, presumably because they feel that it’s a safe site and it allows their employees to access useful news and weather updates. 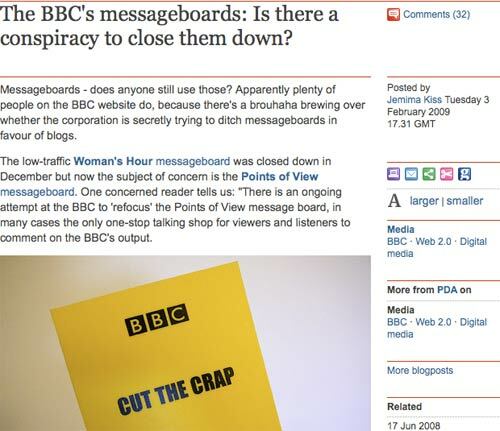 Many organisations are probably unaware that the BBC have message boards and public discussion areas on bbc.co.uk and have no idea that their employees spend large chunks of their workday chatting online via the BBC. I’d suggest that the reason people use the bbc.co.uk forums instead of Digital Spy or UK Nova, is that their workplace blocks the two latter ones - as they can only access the BBC at work, that’s the one they use during the daytime; it’s not necessarily their own preferred choice – it’s purely that they're a captive workplace audience. The thing that baffles me most is why someone would take so much offence at simply being asked to click on a link to somewhere where something they are interested in is being discussed. I've put links in the POV boards to my blog posts. People can discuss those posts anywhere they like but a blog is surely better than a board for posting a considered and sometimes long article, isn't it? "Seeing how events then unfolded is a very interesting study in group dynamics online".. Your article explains why I saw nothing about the closure of the Radio Board until it was a fait accompli, i.e. the discussion about it seems to have been elsewhere. This made it difficult to raise objections, no? People don't like the Blogs because the themes are controlled by the BBC, whereas the Message Board is a place to raise your own points. As an expereinced user of the POV MB, I find the blogs quite hard to find and use. I just want to be able to say what I think of the BBC and TV in general and read what others say and I found the POV Message Board a user friendly place to do so. It's easy to start a thread too. I'm afraid I haven't got the patience to read a lengthy blog where efffectively the BBC is expressing an opinion about the BBC. I'm so fed up that the radio board was closed and the suggestion we should talk about the wireless on the Green Room is a non starter. Agree with Karel... BBC's opinion is purely biased... and I must say that this is one of the reason that other resources are blocked at workplace and only BBC is available!